In this tutorial we will go over steps on how to install and configure Elasticsearch for your development and production environment. One of the best search and analytics engine out there in the world. Elasticsearch is a distributed, JSON-based engine designed for horizontal scalability, maximum reliability, and easy management. Elastic search centrally stores your data so you can discover the expected and uncover the unexpected. You could send all your logs from to ElasticSearch via Filebeat and visualize metrics instantly. 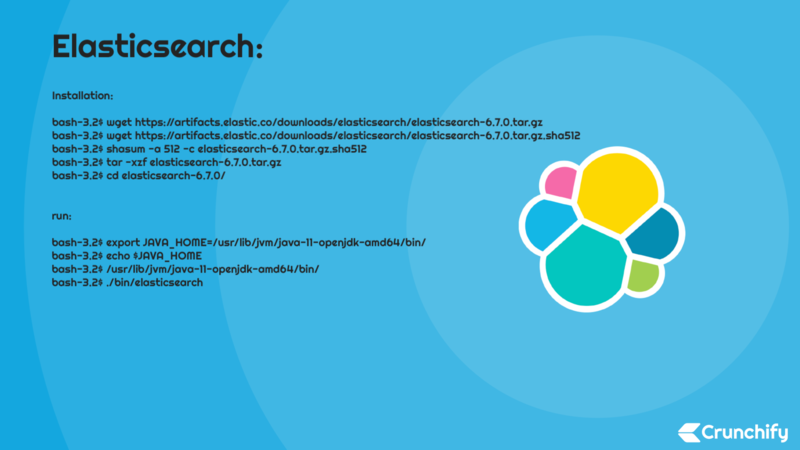 Here are the few simple commands to install Elasticsearch on your Linux/Ubuntu OS. And that’s it. Here are installation logs. Connecting to artifacts.elastic.co (artifacts.elastic.co)|2a04:4e42:a::734|:443... connected. OpenJDK 64-Bit Server VM warning: Option UseConcMarkSweepGC was deprecated in version 9.0 and will likely be removed in a future release. You need to make sure JAVA_HOME is setup correctly. Make sure, you need to start Elastic Search using normal user. ElasticSearch won’t start as a root user and you will see below error if you try to run it as a root user. Follow this tutorial on how to add non-root user and login. How to make sure Elasticsearch is running? That’s it. You are all set running ElasticSearch. How to Install and Configure Memcached Process/Server on Mac OS X?